It is actually true that someone could die of a broken heart. 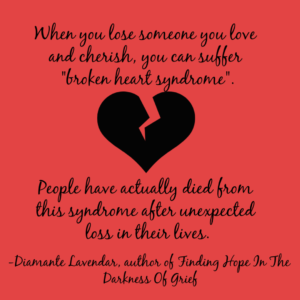 When a loved one suddenly and unexpectedly passes away, those left behind can experience what would seem to be heart trouble. It is thought that broken heart syndrome is caused by a surge of stress hormones in the bereaved person. (mayoclinic.org). When my kids died, it devastated me. It changed my personality and outlook. As each tragedy occurred, I was affected more deeply. Having a broken heart is real. I began writing about the loss in my life not only to vent but also to help other people who found themselves in the same situations. It takes guts to heal and sometimes we don't feel like we can. In my case, my spiritual beliefs have carried me through. If you'd like to read more about my experiences and the insight I gleaned from them, I have three published books that talk about my life. Breaking The Silence and Poetry and Ponderings, which have both been very well received, deal with abuse and loss. Finding Hope In The Darkness Of Grief, my most recent book, speaks of the devastating loss of my 18 year old daughter. These books are inspirational and have helped many people already. It is my prayer that they can help many, many more.